Eyeglasses are corrective lenses mounted in frames. They are used to help people with vision problems see clearly. The lenses are shaped in order to bend light rays. This allows the rays to focus on the back of the eye, or the retina. The need for eyeglasses is determined by the shape and condition of the eye itself. If the eyeball is too shallow, the image passing through the lens focuses behind the retina. When the eye is too deep, the image focuses in front of the retina. When the eye looses its elasticity it tends to focus the image behind the retina. Hyperopia or farsightedness. This condition is caused by a shallow eye-ball. People with farsightedness can see distant objects clearly, but near objects look blurry. Myopia or nearsightedness. This condition is caused by a deep eyeball. People with nearsightedness can see near objects clearly, but not those far away. Presbyopia occurs when the lens of the eye loses it elasticity and it can no longer change shape. The condition is usually associated with age and usually becomes evident after age 40. Presbyopia causes people to be somewhat farsighted. Sometimes this is corrected by wearing bifocals (eyeglasses that have a second lens below the top lens). A person with presbyopia can look through the bottom lens while reading and use the top lens for distant objects. Astigmatism is blurry vision caused by irregular curves in the cornea (the transparent covering of the eye). The irregular curvature makes it impossible for light rays to focus on a single point. An Italian physicist named Salvino degli Armati probably invented eyeglasses in around 1285. He shared the design of his new device with an Italian monk, Allesandro della Spina, who made public the invention and is often given credit for inventing eyeglasses. Most people learn that they need glasses after having an eye exam. 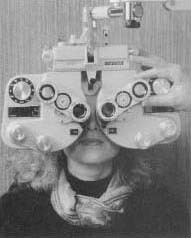 Modern opthalmology equipment has made diagnosing possible vision problems much faster and easier. In the 14th century, Venetian craftsmen known for their work in glass were making "disks for the eyes." The finely ground glass disks were given the name lenses by the Italians because of their similarity in shape to lentil beans. For hundreds of years thereafter, lenses were called glass lentils. The earliest lenses were convex (they bulged outward in the middle and aided people who were far-sighted). Wearing spectacles become common. By the fifteenth century, eye-glasses had found their way to China. In 1451 Nicholas of Cusa (1401-1464) in Germany invented eyeglasses to correct near-sightedness using concave lenses. Rather than bulging in the middle like convex lenses, concave lenses are thinner at the center and thicker at the ends. Early eyeglasses had glass lenses mounted on heavy frames of wood, lead or copper. Natural materials of leather, bone and horn were later used. In the early seventeenth century, lighter frames of steel were developed. Tortoise shell frames came into use in the eighteenth century. In 1746 a French optician named Thomin invented actual eyeglass frames that could be placed over the ears and nose. In the United States, Benjamin Franklin (1706-1790) designed the first bifocals in 1760. The top lens could be used to see distant objects and the bottom lens could be used for close work. The two lenses were joined in a metal frame. With this design it was no longer necessary to have two pair of glasses to be able to see clearly. In England in 1827 Sir George Biddle Airy (1801-1892), an English astronomer and mathematician, made the first glasses to correct astigmatism. To correct this, the exact area of the irregularity of the cornea must first be located. A corresponding area on the eyeglass lens is ground to bring light rays passing through that area into proper focus. Today eyeglasses come in a wide array of styles and designs. Frames are generally made of metal or plastic, and lenses are made of glass or plastic. In 1955 the first unbreakable lenses were made and in 1971 a new lens came out which combined the properties of plastic with glass. During the 1950s the Varilux was invented. This is a corrective lens of variable strength that can be used in place of bifocals. This article is very good,and useful.I like it very much. I will intruduce it to my friend!